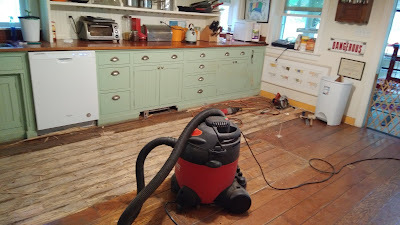 It's official, my house is a mess and my kitchen is now non-functioning. 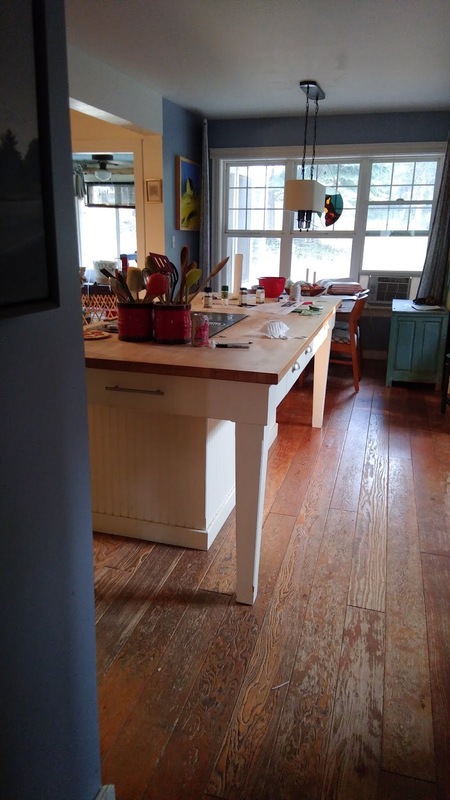 The stove top has been disconnected, the island moved completely out of the kitchen and into the open area between family room and dining room. The new look for the dining room. HA! This is were the OCD comes to roost. This chaos bothers Gene not a bit. Tools strewn here and there, demo debris on the countertops, splintered boards stacked in inconvenient places. In other words, a nightmare for someone who feels the need to bring order and organization. Sigh, I think I will just go weave. And that's what I did. Mongo rides again and beautifully I might add. This is a very wide warp at 48". I stretch out each throw and honestly, it feels good to do so. I made a choice to go less shafts and wider rather do double wide at a narrower width but lift more shafts. I'm happy with that decision. Look how beautiful the pattern is coming out! 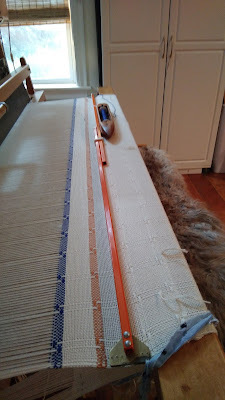 Banket #1 will get 5 different colored stripes at each end. Shown are just the first two. 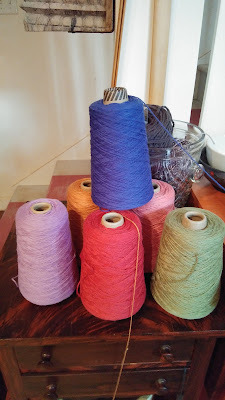 Selection of 4/2 cotton for stripes. Remember I have to replicate this for the second length since they will be sewn together. These will be big blankets. I'm hoping for square 85"x85" or so. Big enough to really use on a bed of size. Go big or go home eh? It's the terrier in me peeping out. Grrrrrrrr! And another satisfying make came out of the sewing room. 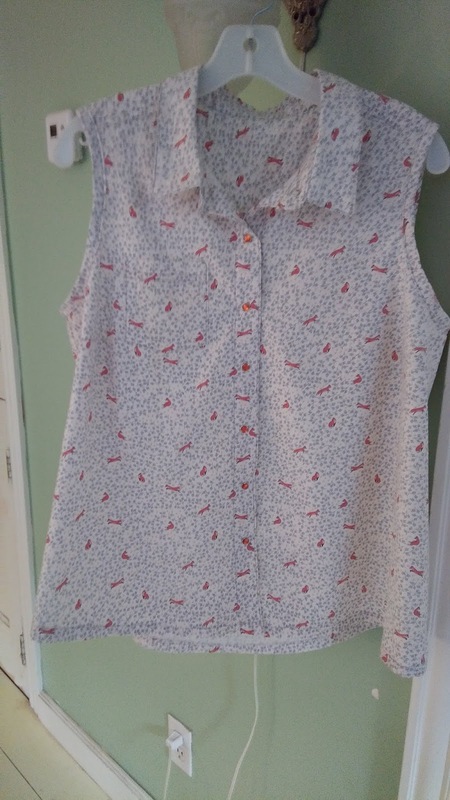 The Jalie Rose blouse is SUCH a nice pattern to make. 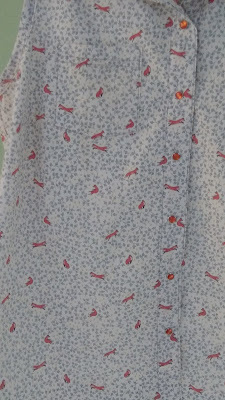 When I saw this little calico type print with a fox (Dear Stella For Fox's Sake Collection, Fox Trot pattern) I knew exactly what to make with it and for once, it met my vision. I wore it out to town with a pair of jeans and sneakers and feeling quite smitten with the whole outfit. Stylin! Actually it reminded me of summers when I was about 10. Light sleeveless summer tops (Grandma made with love) and soft denim jeans and a pair of not so white anymore Keds. I shed years in that shirt yesterday. ;-) Made me want to find a pond and catch frogs. I swear, I can't bear to listen to the news these days and I can't bear not too. 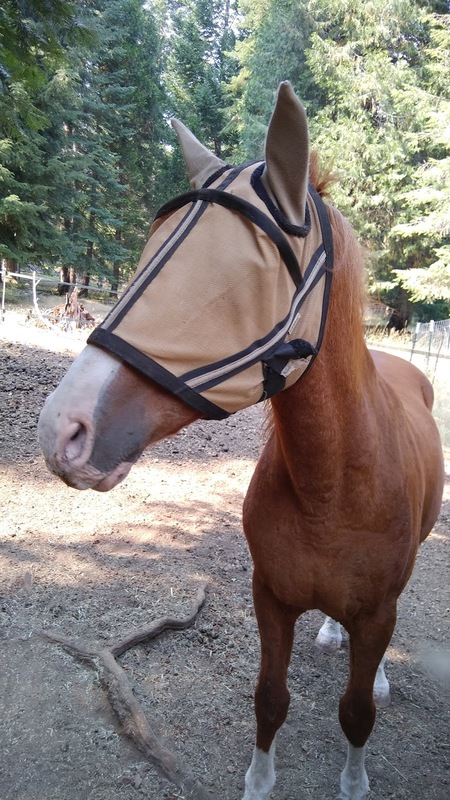 The poor folks in Redding California with the Carr Fire. OMG, is there no good news anywhere these days? 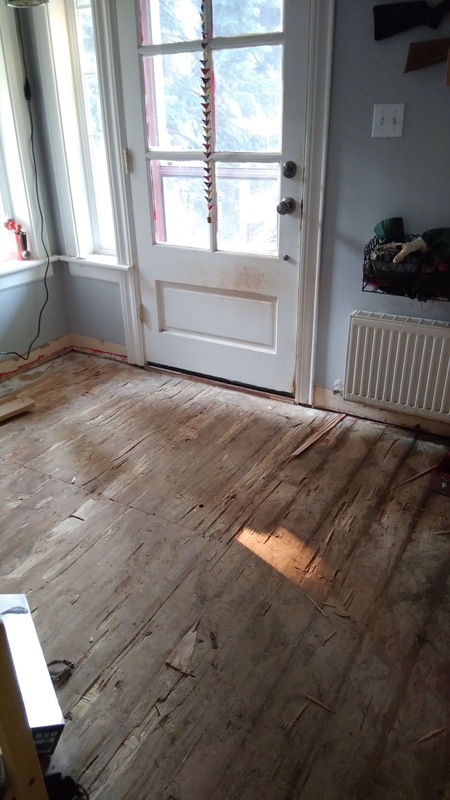 And here I complain about a simple quick remodel. My shame. This is what I got for today. If you're like me you'll still want to tap a toe at least. 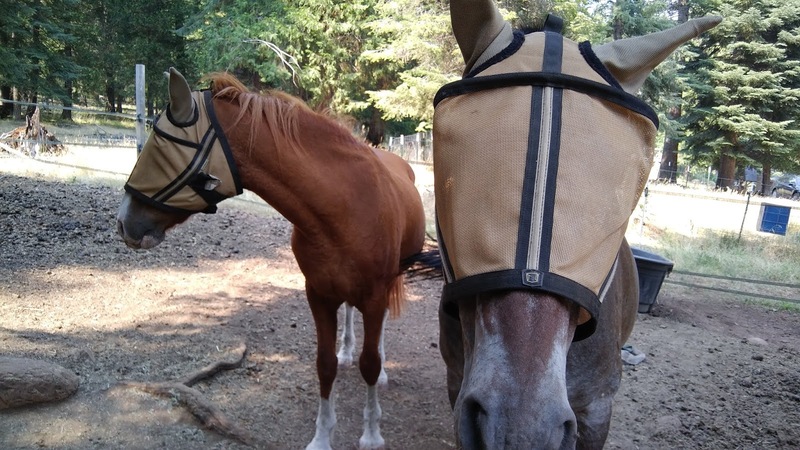 Parting shots: Masked Crusaders Dandy and his sidekick Cooper. That Mongo weave is IMPRESSIVE! To think that people had to do this for ALL their linens and cloth before the Industrial Revolution. No wonder wardrobes and closets were small; fabric was a precious investment of time and materials. Michelle, It is impressive that people worked so hard for cloth. Often times a village would have a weaver or two and bring the fiber for weaving to them be it for cloth or coverlets. We have many things in common! Our love for critters large, small and fibery to name a big one! What I find most appalling is people still back the asshat. Love the blanket in progress. A hint for matching up those stripes on each end when you get to the second panel....if not too late. Use a ribbon or such, and mark each stripe on the ribbon for the first panel, then when weaving the second panel use the marked ribbon to make it all match. 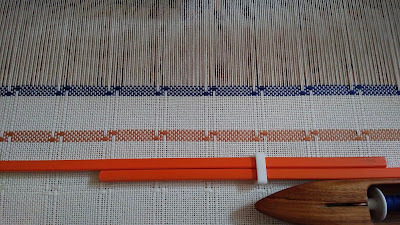 I've done that for 3 panel overshot coverlets - only instead of marking a stripe, I mark weft pattern repeats. Love your new cotton top - I think of pedal pushers with the sleeveless cotton top from when I was young. Your blanket is SUPER! Love the color band colors! 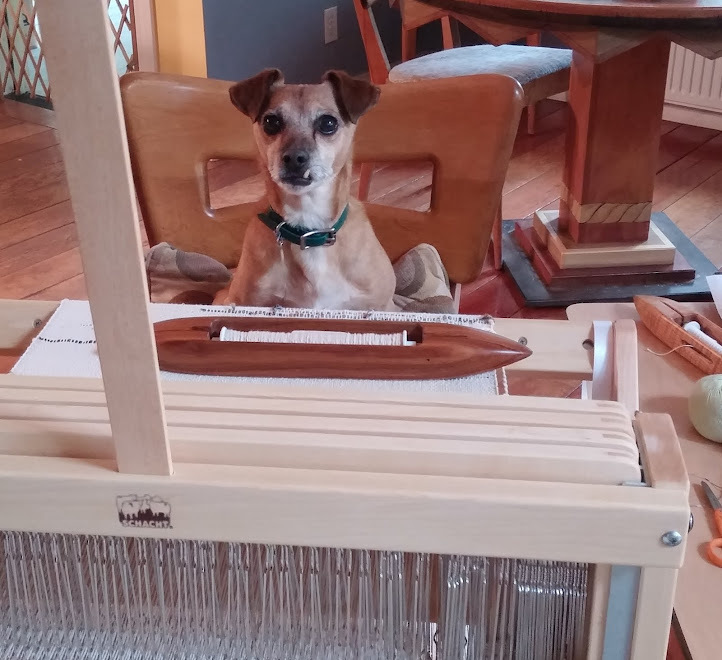 I would think that weaving just might help you ignore the stress of the remodel...maybe a little. 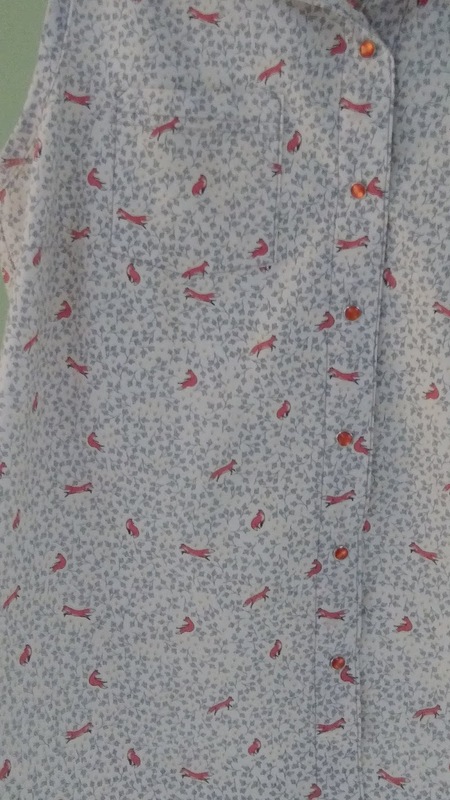 "Stella's Little Foxes"....what a wonderful name for the fabric...right down your alley!!!! I remembered to do just that with the warp Cindie. A length of cloth, marked each end what to do (stripes, hem width, natural portions etc. Ah yes, pedal pushers and shorts with cute cuffs! I adore the aesthetic of Dear Stella in general and they put out some wonderful patterns on a very nice cotton both for quilting AND garments. The guys doing the tiling start tomorrow and then have a big job on the 8th, so they have a week and a few days to finish it up. I keep waiting for either good news or for an overall numbness to put me out of my misery. Still waiting. LOL, I suppose I m a bit of a terrier. Must have spent my past lives making mischief! The BP says what every dog says. Not enough food or attention but they love us anyway. I like weaving blankets and pillowcases. I'm not big on scarves, but useful items, I love doing. 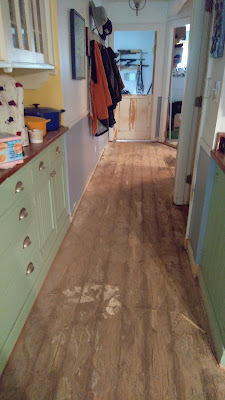 Another person doing reno - I am so impressed, and so glad it's not me. While I am definitely OCD about some things and can let others go completely, I just don't want the long upheaval and many hours of manual labor - and multitude of decisions - that any kind of renovation entail. Better you than me, my dear. Thank you, now I know, those flies must be really annoying.